SGL will never request any personal data or game account data other than what's required for SGL services. In the event that you open a support ticket with SGL - we will, at most, ask for your Steam ID or Character names, that is all SGL needs to find your details in our system. SGL will never ask for this information if you have not initiated contact with us first. You can find the few video guides we have on our YouTube Channel. Some quick answers and questions that might help you. I did not receive a verification e-mail for my account. It is most likely in your junk mail. If not: Contact support. The game I connected is not fetching statistics for my account. The API's we use are really sensitive when it comes to usernames, make sure you have the correct case-sensitive username set or contact support. 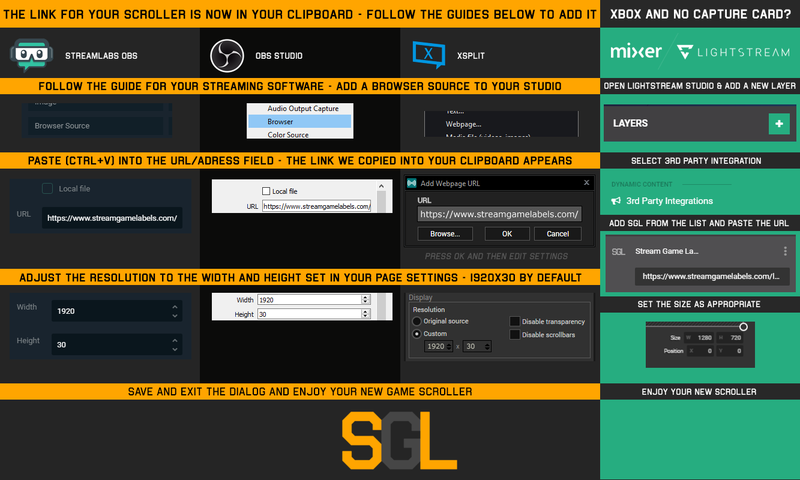 How do I add a label/scroller to my broadcasting software? If you still need assistance you can acquire it by joining our discord server. Stream Game Labels Discord We will respond to your questions within 24 hours.